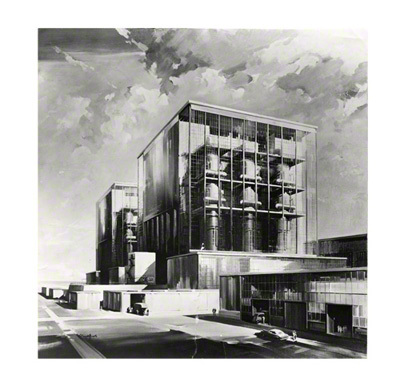 This is a detailed pencil sketch, one of a number of drawings Claude Buckle made of the construction of Hinkley Point A Nuclear Power Station. 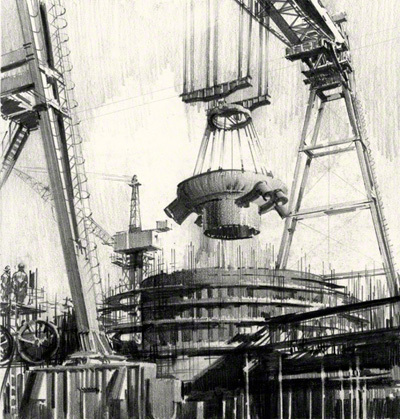 The drawings were used as preparation for the world fair in Brussels in 1958 where the largest commercial painting that Claude Buckle ever painted was exhibited. This is shown below first picture. 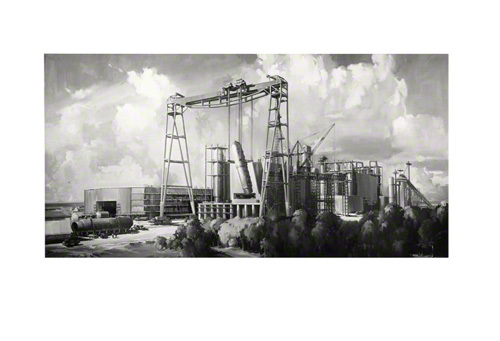 Like the pencil sketch above, the oil painting shows the Goliath Crane in use on the site this time lowering the huge water coolers (heat exchanger) into position. The second picture below shows the finished power station with the water coolers. Hinkley Point is a headland on the Bristol Channel coast of Somerset, England, five miles north of Bridgwater and five miles west of Burnham-on-Sea, close to the mouth of the River Parrett which runs into Bridgwater Bay. Consent for French energy giant EDF to construct Hinkley Point C in Somerset was given in 2013.